At first, I was really struggling with this project. 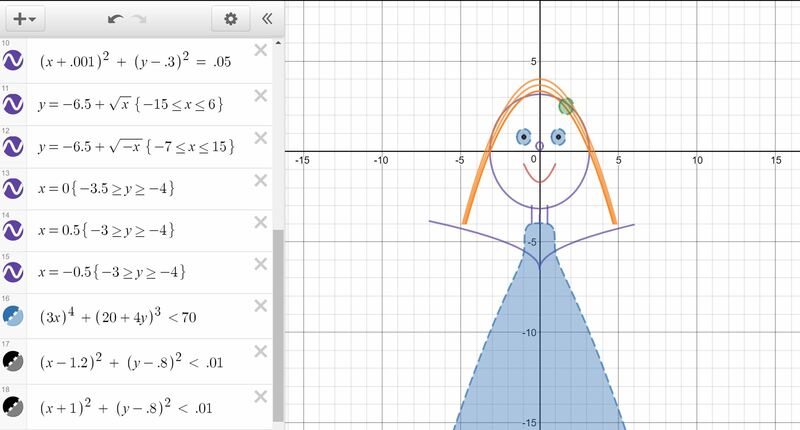 It took me a little while to get the hang of the formulas needed and how to use desmos. 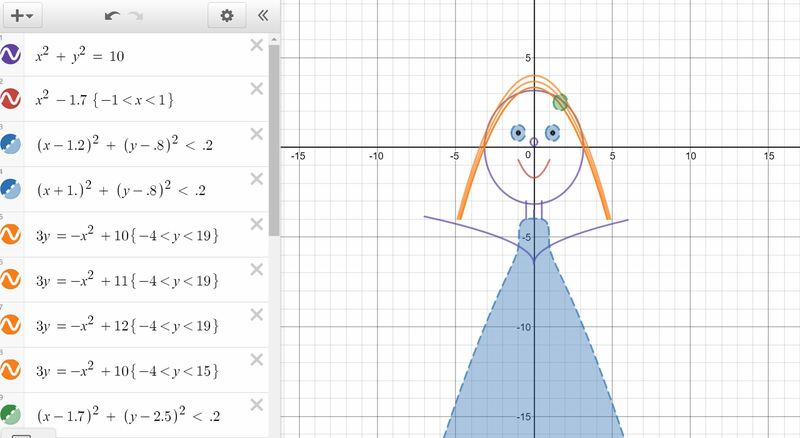 Once I figured out the basics of desmos after playing around with it, I started to form my face. my base was the circle formula, x2 + y2 = r2. That was used for my eyes, face, nose and hair accessory. I then started using different and more complicated formulas to figure out the rest of me. Some challenges I faced was figuring out desmos at the start. It was kind of confusing, but once I got the hang of it I could play with it and create my portrait. My biggest aha moment was when I realized that when you change the signs (negative and positive) to get the mirror image of what I had already created. That was when I really started to get more work done and complete my project. Another aha moment that I had was when I figured out if you replace the equals sign with a greater than or less than sign your shape or line would fill in. That added a really unique touch to my project. The help I got was from Krista, as at the beginning I was really struggling to work my way around desmos, and Krista helped me a lot to figure out what I was doing. Other than that, I tried to work by myself. The strategy I used was duplicating what I had already made, but changing it slightly to get the opposite of what I needed. That made my work faster and it gave me exactly what I needed for my portrait. I learned quite a few things in this project. I learned how to use desmos, which is a very useful tool that I know I will use in my future math. I also learned a lot more about equations. It was hard trying to figure out what would equal to what. However, it is fascinating seeing what all the different equations can do. Overall, I really enjoyed making my self portrait! This entry was posted in Grade 10, Math 10 and tagged mathart. Bookmark the permalink.